It’s sad to say, but as much as people have great ideas to help others and change the world, they’re just not ready and in some cases they never will be. Branding as a business requires so much more than just having an idea. 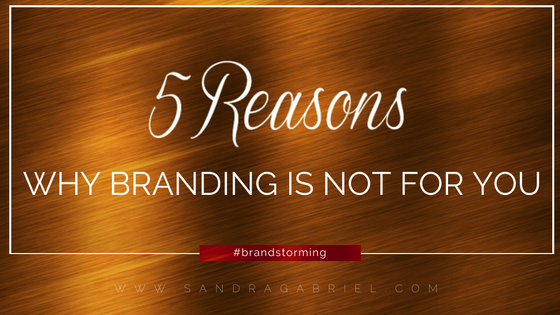 Here are 5 key reasons why YOU might not be ready to roll out your brand. True branding is based on who you are and what you do and how that applies to the work you will be doing in your lifetime, but if you are not clear on what you want to achieve for yourself and others, then it’s impossible to translate yourself into a brand. You need to know what you stand for and the best way to use your gifts and talents to help others. What can you see yourself doing everyday for the rest of your life that you are both passionate about, but also serves your community or society? There’s a saying that those who fail to plan, plan to fail and it’s sooo true. During my career I have probably come across dozens of people who have such great ideas but no plan of action on how to move forward or they don’t know where to start. Some people are even ready to roll out their ideas within weeks which in my mind is a formula for disaster. I believe this is a result of people who want to skip over the hard work it’s going to take to get started and jump right into offering their ideas and then when a couple months pass and nothing is happening, they become discouraged and give up on what is probably a perfectly good idea. Anything worth having, will take time and work to acquire. If you have a great idea, always start with your research. As boring and mundane as research sounds, if you are curious and passionate enough about your idea then you will find yourself immersed in it and discover all kinds of things that will help to build your brand. Some of you think that once you have your idea, you can just throw some advertising at it or print some flyers or promote it on social media and it will “fly off the shelves” but if you don’t know your audience, how will you know what type of marketing will work for you? Proper marketing is built on knowing your audience. You have to know where they work, shop, eat, drink, their education level, how old they are, what their needs are and more so that you can properly market to them. For example, if I know that my target goes to Starbucks for their coffee every morning, then I need to be in front of Starbucks handing out a flyer or posting a flyer in Starbucks. Or if I know my target does everything through their mobile file, then I need to think up a mobile marketing strategy. You would be surprised to know how much marketing dollars are wasted on tactics that produce little to no return. Branding yourself or your business is a very involved process and if you are too busy with work, school, kids and other activities, then branding is not for you. Until you are ready to make a daily commitment to building and promoting your brand then you should probably wait until you’re ready. Even if you hire the best branding agency in the world, they can only do so much for you without your involvement. I have worked with clients who want to see the greatest results but have very little time to devote to their brand and it has a huge impact on the kind of results I can produce. But when I work with clients who are actively involved in their brand activities on a daily basis, the results are astounding. You are your brand and your brand is you, if you don’t show up, no one else will. It’s true that your brand can exist with little to no funds, but who in this world wants to just exist? If you are a brand, you want to do more than exist, you want to connect with people, change lives, make your mark and have an impact on the world and that requires an investment. People who want nice cars and big beautiful homes invest in it, because they take it seriously and know the value and the returns. Branding is no different. Corporations and Fortune 500 companies invest millions of dollars in advertising alone, not to mention marketing collateral, public relations, social media and the salaries of their marketing department; but when you look at the returns on that investment, it all makes sense. When it comes to building a branding, you will get out of it what you put in. But you have to be ready, willing and able to put in and not just in terms of time or financially, but emotionally and mentally. Do you have an idea you’ve been sitting on that you could use some feedback on? Sign-up for a mentor session with me here.